The possibility of using special characters in group or folder names has been limited to avoid incompatibilty issues in Mac Finder or Windows Explorer. 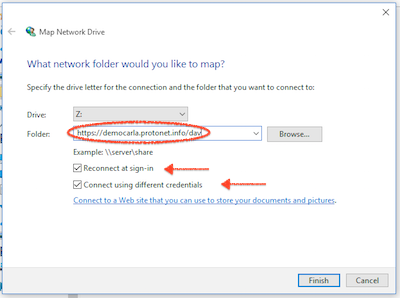 This how-to is about mapping the Protonet solution as a network drive in Windows Explorer using the WebDAV protocol. 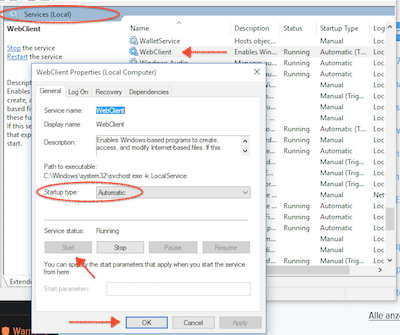 This enables accessing the data stored in groups, private folders and volumes. The complete web address and user name can be looked up in SOUL in the “Help” section, “Explorer integration”. Next follow the arrows on the screenshots. 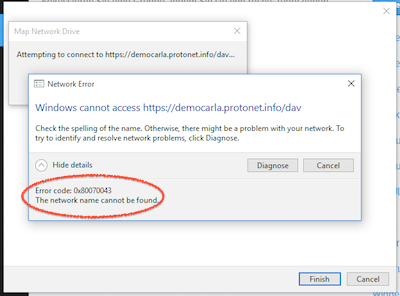 At least one folder or network share defined for this user in the Protonet solution. Move on directly with 4. if there is no error message. Provide the SOUL user name & password. Activate the checkbox. 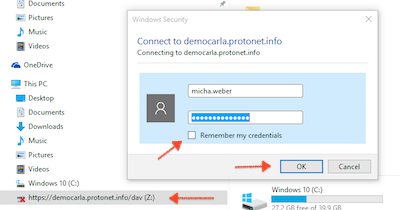 How can I transfer files to my Protonet server? This article explaines how to move files from a NAS, MAC, Windows PC, external hard drives and so on to the Protonet server. First, choose a destination for your files on the Protonet server. That could be a folder in a group or a network volume. You can create a group and a folder in that group via its Files section. Only groups that have folders within them can be seen over SMB and WebDAV in Windows Explorer and MacOS Finder. In this example, the group name is Backup2016 and the folder name is FileStorage. Instructions can be found in SOUL navigation bar under Help and then either Explorer integration or Finder integration. Within Explorer or Finder, navigate to the folder you created and copy the files you want to transfer into this folder. In this example, the folder structure looks like this: Groups → Backup2016 → FileStorage. Note that files can only be copied in the FileStorage folder, not in any folder above it. For the fastest possible transfer, it is important that both your computer and the Protonet server are connected via cable to the same network. This usually means both devices are connected to the same router via network cable. Use a gigabit network if possible and connect to the servers IP address via SMB for best results. We suggest that you do not transfer large amounts of data over wifi. For mobile devices without a network port, USB- or Thunderbolt to network adapters are available cheaply. Make sure to pick a USB 3.0 adapter! The following steps are recommendations for working with files in MacOS Finder and are based on the experiences of the Protonet Support team and our customers. We collected these steps to enable you to skip known pitfalls, slowdowns and problems. Use the Protonet box on the gigabit-port of your router. Have your computer connected to a network cable instead of using wifi. Use the latest version of your operating system and Protonet SOUL. b. * / : ? Apple has provided more information about which characters should be avoided here. 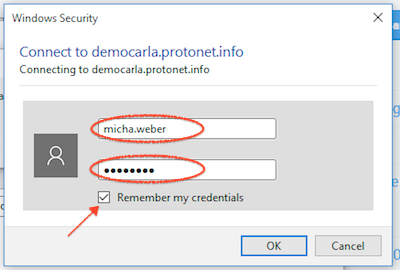 Use Samba (smb://ip-adress/) instead of AFP – Note: Using both SMB and AFP is not recommended, especially in mix-environments (Mac + Windows). Download Office documents onto your Mac, edit them locally and then upload them. Office does not always clean up its so called ‘lock-files’ which may cause problems. Also storing Office files via internet connections can fail, especially if connections are slow. Do you use Adobe software? Check for each product wether working on network drives is officially supported by Adobe. Adobe themselves are discouraging from working on network drives for these good reasons. Deactivate previews/thumbnails in Finder or choose a different view. Also deactivate filesize calculation in Finder (German instructions). Moving folders and lots of files within the server is faster via WebDav protocol. Exclude network drives from virus scans, if you have any antivirus software running locally. iPhoto/iTunes/… libraries are only to be saved locally on your mac, according to Apple.